This is the 10th release by this very interesting Hungarian group. I have only heard one other of their CDs and it was great. This can be compared with Korai Öröm and Vagtazó Halottkémek. It lies somewhere in between the two groups, not as rhythmic as Korai and not as frantic as Vagtazó. A wide range of Eastern instruments are played and experimented with and the male lead vocals play a major role in this band. The songs are sung in English on this CD. Some great building space rock stuff though on this Stereodream experience. By track 3 the CD is really grooving and there are some great synthesizers. The CD is full of great rich lush sounds and productions, which is highlighted in the great "House Of The Witches. Quite an excellent new CD, showing a continued fresh and interesting sound and evolution. 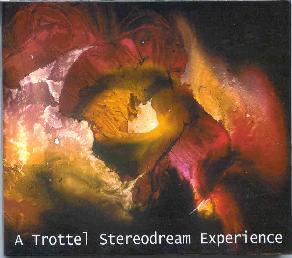 For more information you can visit the Trottel Stereodream Experience web site at: http://www.trottel.mentha.hu.